The best brush for Cocker Spaniels gets through those tough tangles. And it does it without damaging their fur, or getting them caught up in knots! If you’re about to get a Cocker Spaniel, or have one happily living at home, albeit looking a little matted, it’s time to take action! Do Cocker Spaniels Need Brushing? Your Cocker Spaniel has a long, silky coat. In some dogs, the gorgeous coat can grow right down to the floor. Cocker Spaniel coats come in many colors, including black, tan, white and buff, tri-color, brown and silver. Whatever his color or coat length, your Cocker Spaniel will need brushing. Why? Every breed of dog needs to be brushed. But regular brushing isn’t only necessary to keep your pup looking his best; brushing your Cocker Spaniel is also great for his health. Grooming your pup with a quality brush has a massaging effect to promote good circulation. Brushing also distributes the natural oils produced by your dog’s skin through his coat, keeping it water-resistant, glossy and shiny. Dogs such as Cocker Spaniels have long hair that can become matted and tangled. If they’re left untreated, mats can cause the coat to pull on the dog’s skin, causing pain, and in some cases, chronic skin problems. Regular brushing and grooming can help to prevent the coat from becoming tangled and stops mats from forming. Cocker Spaniels are traditionally working dogs, and they love to spend time rooting around in long grass, brambles and bushes. That means your dog could pick up ticks, fleas and grass seeds, which are all potential causes of health problems. What Types of Fur Do Cocker Spaniels Have? A Cocker Spaniel’s double-coated fur is medium to long. A double coat has long, fine, silky hairs on the top of the dog’s body and a short, soft undercoat beneath. How Often Should You Brush a Cocker Spaniel? Cocker Spaniels should ideally be brushed every two to three days. However, if you take lots of muddy walks in the country with your Cocker Spaniel, you may need to brush him each time to remove burrs, grass seeds and any other grime he’s picked up. That means that your dog will lose some of his soft undercoat to some extent all year round. Cocker Spaniels have two main shedding seasons that occur during the spring and fall to coincide with the change in temperature and daylight hours. When your dog is shedding, groom him every day to prevent his coat from matting. Daily brushing will guard against mats, keeps your dog comfortable, and will also prevent your home and vehicle from becoming festooned with shed dog hair. We’ve picked out and reviewed a range of the best dog brushes for Cocker Spaniels to save you the leg work. All these high-quality, effective grooming brushes can be bought online from Amazon. Read details and reviews about these suggested brushes, and click the links to order. Although it’s not strictly a brush, a de-shedding tool is an important addition to your Cocker Spaniel’s grooming kit. De-shedding tools are essential for periods when your dog is shedding his coat. The tool will remove around 90 percent of your Cocker Spaniel’s loose underfur along with any dead hair. Your carpet, furniture and car upholstery will thank you for it. A well-known de-shedding tool that is a go-to for most professional dog groomers is the Furminator De-shedding Tool for Dogs. The Furminator you’ll need for your Cocker Spaniel is the long-hair version. The tool is a single stainless steel clipping blade fixed into a strong plastic guard. To use the Furminator, pull it gently through the dog’s coat to pull out any loose and dead hair. Clean the tool simply by pressing the self-cleaning button. The Furminator has a big reputation and comes with a price to match. If you have a smaller budget, you might want to try the HappyDogz Pet Grooming Shedding Brush instead. This tool works just as well as the Furminator but has the minor inconvenience of not having a self-cleaning button. That means you have to remove the hair from the tool with your fingers. A slicker brush is an essential brush that you’ll need in your Cocker Spaniel grooming kit. Slicker brushes have a pad of fine, hooked wire bristles that penetrate the dog’s coat, pulling out any dead hair and small mats. We recommend the Pet Portal Pro Quality Self Cleaning Slicker Brush. The Pet Portal is a pro-grade grooming tool that has the added benefit of a self-cleaning button, saving you the time and hassle of pulling dead hair out of the brush once you’ve finished grooming your dog. If you want a slightly cheaper slicker brush, you might like to opt for the Pet Neat Self Cleaning Slicker Brush. This brush also has a self-cleaning button and is well-made, so it will do the job and should last you for many years. The last brush you’ll need to buy for your Cocker Spaniel is a soft-bristled brush. 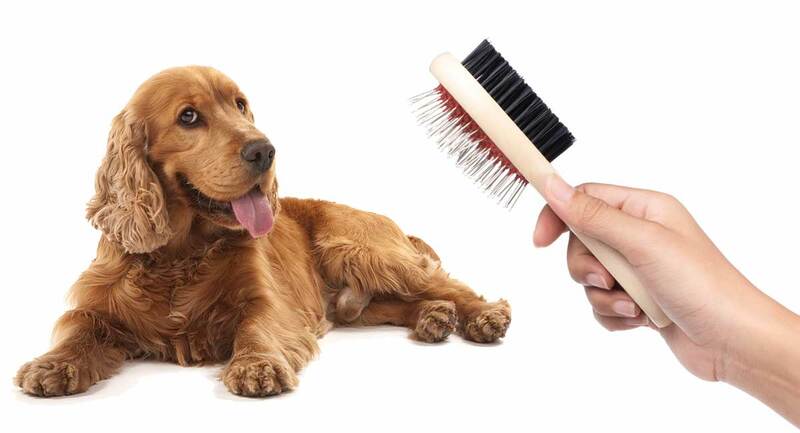 The bristle brush is used to lift any loose hair from the surface of the dog’s coat after you’ve finished grooming him with the slicker brush and de-shedding tool. A best seller on Amazon and our favorite is the Safari Pin & Bristle Brush for Dogs. The Safari is a reasonably priced brush that has super-soft bristles on one side and metal pins with skin-safe, rounded tips on the other. The pin side can be used to remove mats, twigs and leaves after a country ramble. You can then finish off the job with the soft bristle brush side of the tool. If you have a larger budget, you might want to splash out on the HaloVa Pet Comb, Professional Double Sided Pin & Bristle Bamboo Brush. The HaloVa is a high-quality, pro-grade brush that has all-natural bristles and soft, round-ended pins that won’t scratch your pet’s skin. The brush itself is made from attractive, responsibly sourced wood. The handle is ergonomically designed for comfort, making it ideal for prolonged grooming sessions. So, now that you’ve got your brushes, you need to know how to brush your Cocker Spaniel. Always work in the direction of the hair growth so that you don’t pull against the dog’s skin. Tackle small sections of the hair, working from the top of the dog’s back downward. Pay particular attention to areas such as underneath your pup’s harness or collar because these areas can be prone to mats. Begin by carefully removing mats using your fingers. Next, use your slicker brush to groom the whole of your dog. The slicker will instantly remove loose, dead hair. If the dog is shedding, use your de-shedding tool to groom the whole dog, working from his head, across his body, and finally down his legs and tail. Finally, complete the process by brushing your dog with a soft-bristled brush to pick up any remaining loose hairs that are clinging to the top of his coat. Cocker Spaniels have long, pendulous ears that have a habit of trailing over everything as the dog sniffs the ground. Pay particular attention to your pup’s ears. Carefully and gently tease away any mats from behind and under each ear. Then brush the “leathers” (ear flaps), which is where you’ll find most of the tangles and mats. Cocker Spaniels often suffer from ear problems that can occur when the ear openings become obstructed by an overgrowth of thick hair. That causes poor ventilation of the ear openings, allowing the ear canal to become moist. a perfect environment for bacteria. Keep the ear openings clear by trimming away excess hair with a set of sharp scissors. If your Cocker Spaniel likes to play in the mud or swim in stinky ponds, you may need to bathe him once a month or so. Baths also help to get rid of accumulations of natural oils that could cause that distinctive “doggy” smell you want to avoid. Once you’ve finished bathing your dog, make sure he’s dry before you try to brush him. If you decide to use a high-velocity dryer for this job, blow-dry the coat in the direction in which you want it to lay when it’s completely dry to avoid matting. The SHELANDY 3.2HP Stepless Adjustable Speed Pet Hair Force Dryer Dog Grooming Blower with Heater is used by many pro groomers and is also an Amazon best-seller. For a brilliant demonstration on how to brush your Cocker Spaniel, take a look at this awesome video. Never completely clip your dog. The Cocker’s double coat has evolved to keep the dog cool and protected from the sun during summer, and dry and warm during winter. If you clip all the hair off, you will remove the dog’s natural, protective insulation, running the risk of your Cocker Spaniel getting chills or heatstroke. Clipping can also inflict permanent damage to the coat, and that glorious, cascading silken fur may never grow back properly. However, your Cocker Spaniel will have tufty hairs on the ends of his ear leathers, between his paws and on the top of his head. You can trim these areas to prevent matting and to keep your pup looking sharp. If you like the look of your Cocker’s natty head tufts, you could leave them as they are. Also, if your dog has dark fur, the head tufts often fade, leaving your pup with lovely, natural highlights that are sure to be the envy of every other dog in the dog park. Regularly brushing your Cocker Spaniel is essential to keep his skin and coat in top condition, particularly during his two annual shedding periods. Use a de-shedding tool and a slicker brush to get rid of loose hair and dead underfur, followed by a quick once-over with a soft-bristled brush to pick up any stray hairs from the top of your dog’s coat. If you have a Cocker Spaniel, we would love to hear about your pet. Share your grooming tips with us in the comment box below.